How Do Your Schools Rate? Experienced Personal Injury Trial Lawyers Serving Cleveland, Cuyahoga, Lorain, Medina, Akron and Northeast Ohio. The Czack Law Firm is an experienced and well-respected law firm of trial lawyers who make a difference in people's lives. We have successfully represented thousands of clients and have a strong record of success throughout Northeast Ohio and surrounding areas, including Lake, Ashtabula, Cuyahoga, Medina, Lorain, Summit, Geauga, Portage Counties and surrounding communities. Navigating the turbulent waters of today’s legal system can be a risky venture unless you have experienced personal injury trial lawyers like The Czack Law Firm guiding you throughout the process. Insurance companies have lawyers protecting their interests – The Czack Law Firm will protect your interests as they have for Ohioans for over 30 years. From its inception, The Czack Law Firm has earned a reputation for aggressively protecting its clients and has a track record of proven courtroom success and client satisfaction. We will provide you with a beacon of light in the resolution of your legal issues, whether you've had a serious injury, lost a loved one, or have been involved in a complex or high profile case. 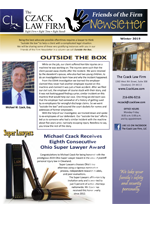 The Czack Law Firm is also proud of its distinction as a firm willing to take difficult cases and to "think outside the box" in order to protect their clients and maximize damage and loss recoveries. In an era where quick and easy is the norm, Mr. Czack has always believed hard work and perseverance produce top results. The Czack Law Firm is dedicated to providing uncompromising, high-quality legal services, with a "client-first" personal touch, to serious injury and wrongful death victims and their families. Once you experience the professional and "client-first" culture at our firm, you will understand why both former clients and our peers consistently give us top reviews and ratings. Full Coverage Insurance Can Leave You Fully Exposed. Everyone thinks they are buying ‘full coverage’ insurance, but read the fine print and you’ll find out that believing that promise could leave you liable for more than you can possibly handle. 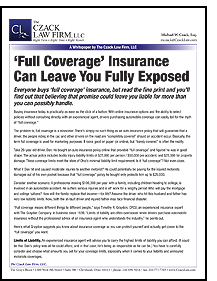 Download or read our white paper to find out what the insurance companies don't want you to know about "full coverage" insurance. Get our quarterly newsletter full of helpful information. Download or read our latest issue of “Friend of the Firm” Newsletter. Become a “Friend of The Firm” and get the newsletter 4 times a year. Just wanted to let you know how pleased we were in the handling of our truck accident case. You and your staff were extremely professional and always attentive to our needs and questions. Most importantly, we couldn’t be happier with the results that you were able to get for us. We will definitely stay in touch and wish you the best of luck. I cannot thank you enough for all that you did for us. I appreciate the time and your concern you showed to my husband and me. As unfortunate as it was, we could not have asked for a better experience. Thank you so much. We have to stay in touch! We wish you the best of luck! I am writing to thank you for the great job you did winning my case. I am grateful to have met you and have you as my lawyer. After what happened at work, I never thought my life would get back to anywhere near normal but you’ve greatly assisted in doing that. Thank you so much and best of luck to you and your staff. The Czack Law Firm and Michael Czack support, and are personally active with many civic organizations and charities in Northeast Ohio. We Are Fighting the Opioid Epidemic! We can provide you with legal advice and representation without money up front or out of your pocket. NO cost, NO obligation. Call 216-696-9216. We are award winning representation and a historic track record by a former partner of the legendary Tohnnie L. Hochran and former managing partner of The Firm in New Hampsire. Aenean sollicitudin, lorem quis bibendum auctor, nisi elit consequat ipsum, nec sagittis sem nibh id elit. Proin gravida nibh vel velit auctor aliquet. Aenean sollicitudin.Proin gravida nibh vel velit auctor aliquet. Aenean sollicitudin, lorem quis bibendum auctor, nisi elit consequat ipsum, nec sagittis sem nibh id elit. Proin gravida nibh vel velit auctor aliquet. Orem ipsum dolor sit amet, consectetur adipiscing elit. Mauris tristique lobortis orci ac lacinia. Fusce eu purus eget diam vehicula auctor nec eu elit. Copyright © 2019 The Czack Law Firm. All Rights Reserved.